Fat Lacquers - Pizza Night Collection (Pt 1, The Toppings) - Polish Etc. I have a fun new collection to share with you all today. 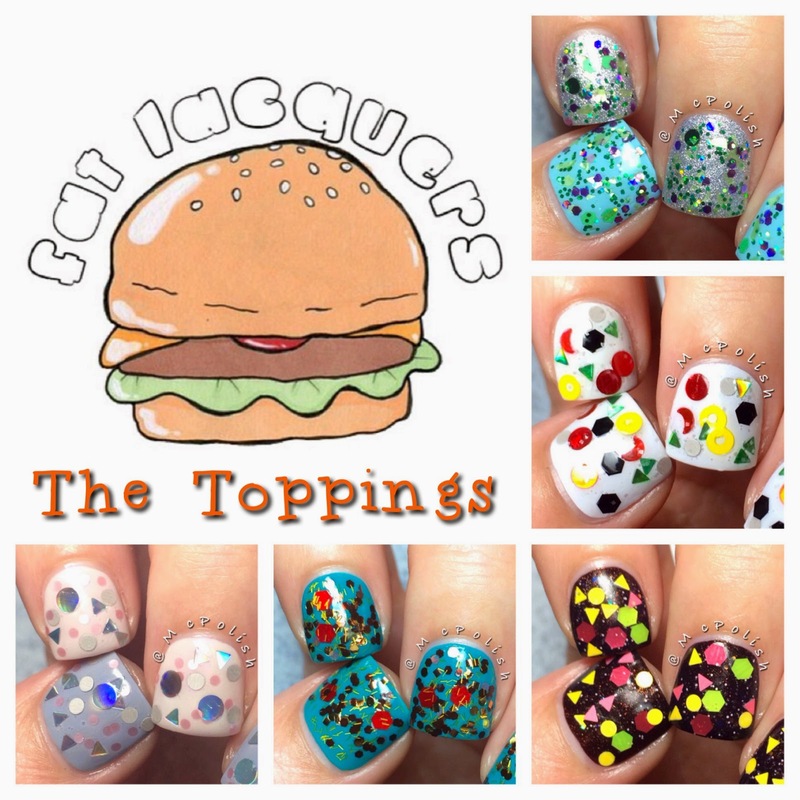 Fat Lacquers has come up with a clever concept of making pizza topping glitters. 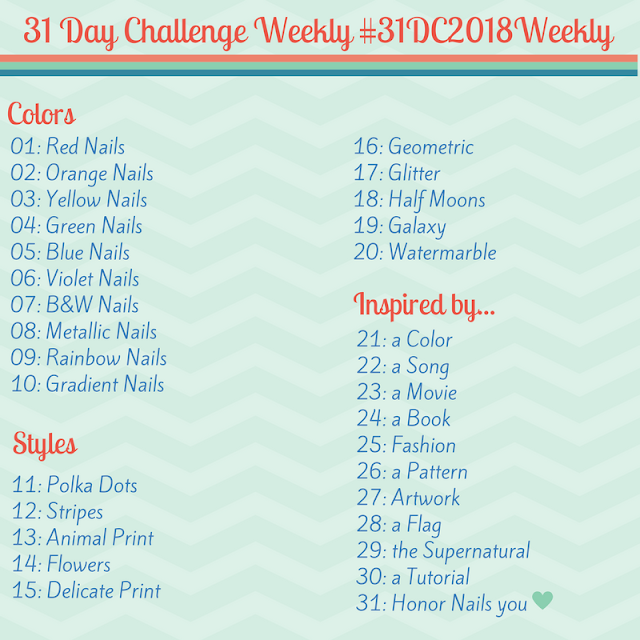 With the recent surge of triangle and donut glitter shapes in the indie polish market, this collection is a perfect fit. 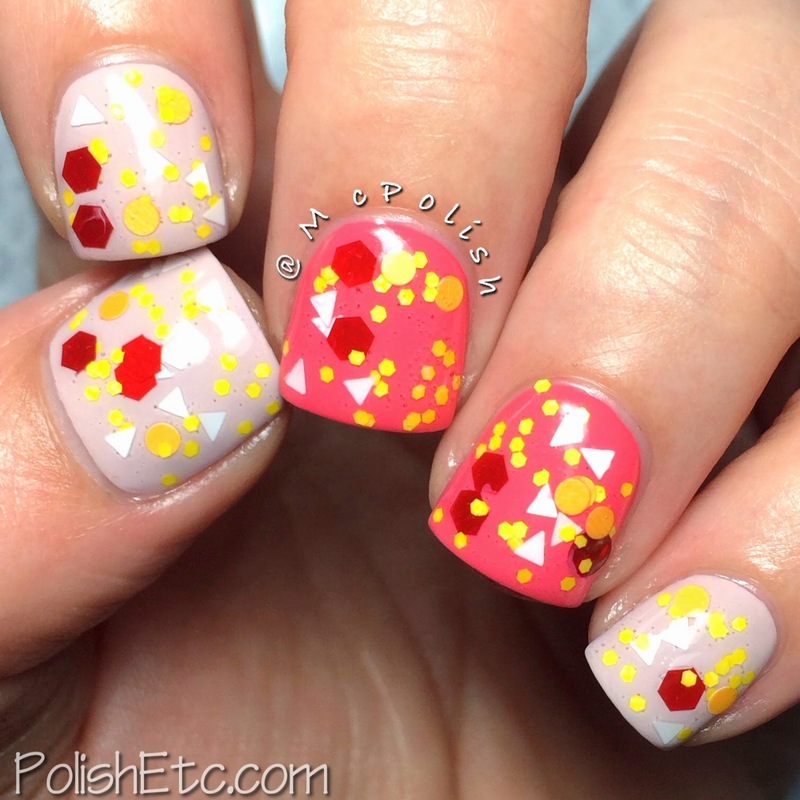 Felicia divided this 12 polish collection into two groups: The Toppings and The Bases. Today I will show you the toppings. When I first saw the bottle shots of these glitter polishes, knew exactly what types of pizza toppings each of them represented. I am sure you will be able to pick them out, too. So grab a slice and let's dive in! First up is "Supreme Supreme". I think this glitter topper is one of the most spot on topping look-a-likes in this collection. Pepperoni, sausage, onions, green peppers, mushrooms...it's all there!. I used one dabbed on coat over OPI My Boyfriend Scales Walls. Next is one of my favorites of the topping glitter. "Veggies & Veggies & Veggies" is a nice mix of purple and green glitters and mint green shards. It is one of the more traditional glitter toppers in this collection. But it is still fabulous! I used one coat over Layla Soft Touch 01 and Tillie Polish Pool Boy. The most popular pizza topping is next, "3 Cheese and Pepperoni". And that is exactly what this glitter topper conveys, three cheesy glitters and some big, red pepperonis! I dabbed once coat over OPI Don't Bossanova Me Around and China Glaze Surreal Appeal. "I <3 Meats" is up next. This combo of large hexes, small hexes, small circles and tiny bars looks great over a variety of colors. This makes we want a sausage pizza! I used once coat over OPI Fly, excellent glitter coverage. This pink and yellow topping glitter could only be one thing, Hawaiian pizza. The name is "Slice of Hawaii" and I thought those bright glitters looked best over darker colors. I dabbed one coat over Sinful Colors Leather Loose. Do you like fruit on your pizza? I do! Last but not least is another one of my favorite toppings glitter, "Anchovies All Over". Now I know most people don't like anchovies on their pizza...but I love anchovies inspired glitter. I am a sucker for grey and pink combinations. There is a good balance of circles and triangles that are both holographic and matte. I love it! I dabbed one coat over Orly Dare to Bare and Tillie Polish Hot Stone Massage. Fat Lacquers is launching the entire Pizza Night collection on June1st. There will be options to buy the whole collection, buy each set separately and to build your own pizza. Also check out Felicia's base and top coat. I used "Drive Through", her quick dry, glossy top coat, for all of these swatches. It has bumped it's way into my top three top coats ever! You must give it a try. I just love the idea! :) And the Veggies and Hawaii topper are my favs.